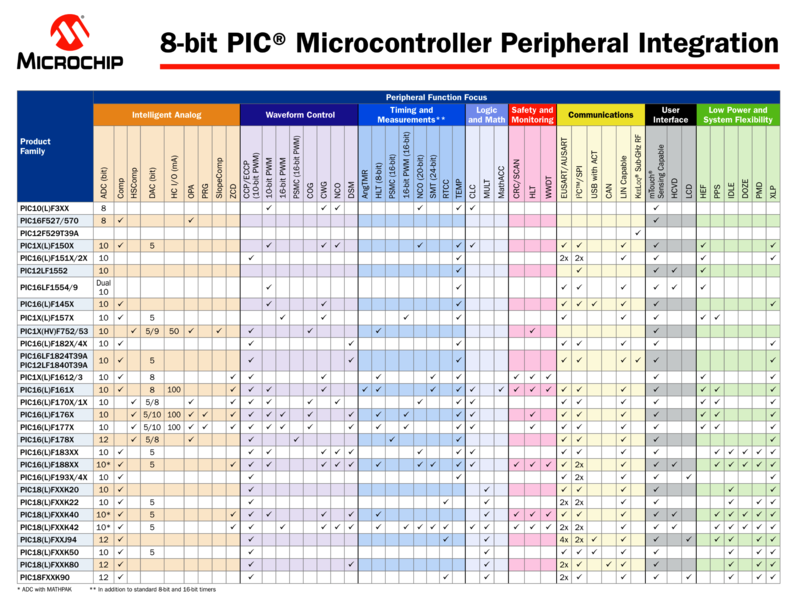 8-Bit PIC® Microcontrollers come in several core architectures. This can be confusing to someone trying to decide the best choice for their product or project. This summary will describe the different options to help you make the correct choice. The 8-bit PIC Microcontroller uses a RISC architecture that has a separate address and data bus. This means they can be separate in size as well. All 8-bit PIC Microcontrollers have an 8-bit wide data bus but the program bus will vary in size depending on the family. This can also cause confusion since the memory structure of an 8-bit PIC Microcontroller will be reported in words of a size equal to the program bus not the data bus. A larger program bus allows the device to place more information in one instruction line and thus more efficient execution. So memory for each device is reported in words and then a byte reference. For example, an 8 K program memory on a 14-bit core device contains 8 K words of program space which is the equivalent of 14 K of space in bytes. All 8-bit devices execute assembly commands in one instruction cycle except for branches and fetches. This makes for a very efficient operating system. The oscillator speed in most devices is divided by four to produce the instruction clock but enhanced parts have a Phase Lock Loop (PLL) feature that allows you to step up the oscillator by four before the divide to get a one to one relationship between the oscillator speed and the instruction clock speed. The 8-bit family has some of the lowest current draws in the industry and many features that will run in sleep mode. The Baseline can be recognized by their part number structure. You can see the full line-up of Baseline devices on this page: Baseline Devices. Mid-Range PIC Microcontrollers are the next tier in performance and has features from the Baseline PIC microcontrollers. Utilizing a 14-bit instruction word, these peripheral-rich devices are ideal for many applications that require a higher level of embedded control and more memory. The Mid-Range can be recognized by their part number structure. You can see the full line-up of Enhanced Mid-Range devices on this page: Mid-Range Devices. The newest family is the Enhanced Mid-Range core which builds upon the best elements of the Mid-Range core and provides additional performance while maintaining compatibility with Mid-Range PIC MCUs for true product migration. 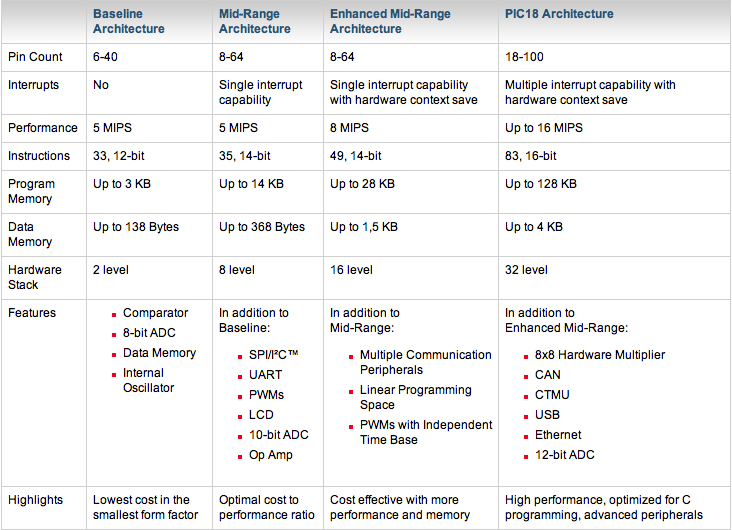 These devices have the latest features and the lowest power in the 8-bit core. The Enhanced core adds more program memory and higher operating speeds. They also feature the highest accuracy, highest frequency internal oscillators. The Enhanced Mid-Range can be recognized by their part number structure. You can see the full line-up of Enhanced Mid-Range devices on this page: Enhanced Mid-Range Devices. These parts have their own prefix namely, PIC18. This family combines the maximum level of performance and integration with the ease-of-use of an 8-bit architecture. With up to 16 MIPS of processing power, PIC18 Microcontrollers feature advanced peripherals, such as CAN, USB, Ethernet, LCD, and CTMU. They offer the largest pin count and memory size in the 8-bit family of parts. The architecture is optimized for C programming. The High-End devices can be recognized by their part number structure. You can see the full line-up of High-End PIC18 devices on this page: High-End Devices. All the 8-bit devices can be programmed/debugged with the same set of Microchip Development Tools.